Ethel McClellan Plummer was born March 30, 1878 in Brooklyn, New York. Her father, Roswell McClellan Plummer, was born in 1852 in NY. Her mother, Eliza Bloom, was born in 1856 in NY. Her parents married on December 23, 1876. 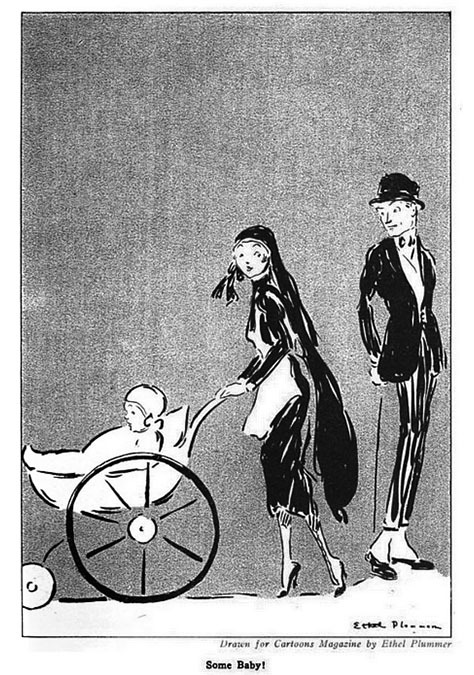 They had only one child. The family lived at 25 Butler Street. The father was a Bank Clerk at the Brooklyn Safety Deposit Company. The 1880 U.S. Census recorded Roswell Plummer was age twenty-eight, his wife Eliza Plummer was age twenty-four, and their daughter Ethel Plummer was age two. In 1892 there was a special New York State Census that recorded the age of Ethel Plummer as fourteen, which confirms her birth in 1878. In 1897 Ethel Plummer was listed as a member of the Senior Class at Brooklyn's Adelphi Academy on Lafayette Avenue and Ryerson Street. It was one of the oldest preparatory schools in NYC. She was enrolled in the Art Department. The Plummer family lived nearby at 397 Lafayette Avenue. Beginning with the 1900 Census, Eliza and Ethel Plummer persistently shaved years off their ages by claiming later dates of birth. In 1902 Ethel Plummer lived with her parents at 418 Hancock Street in Brooklyn. In 1904 she studied art with Robert Henri (1865-1929) and Francis Luis Mora (1874-1940) at the New York School of Art at 57 West 57th Street. The school was founded by William Merritt Chase (1849-1916) as a radical off-shoot of the Art Students League, which was nearby at 215 West 57th Street. Robert Henri was among the most influential artists in America at that time. His unique journalistic approach to art advocated a naked reflection of the harsh realities of modern life. He was a leading figure in a radical art group, The Eight, and the art movement known as the Ashcan School of Art. In 1910 Ethel Plummer lived with her parents at 129 Columbia Heights in Brooklyn. 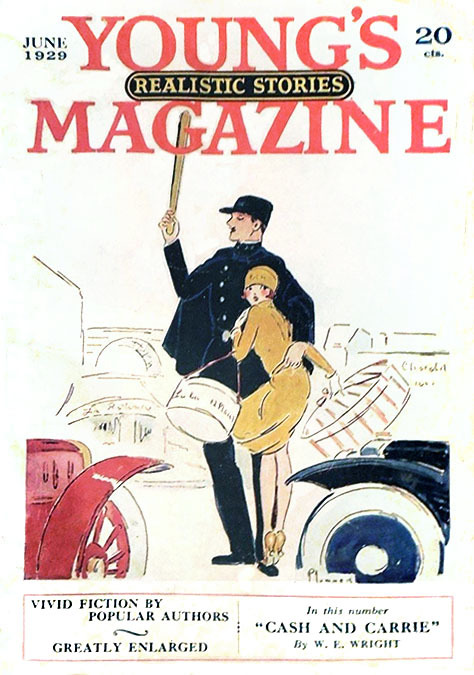 By 1912 she was a freelance artist drawing illustrations for newspapers, books, magazines and advertisments. 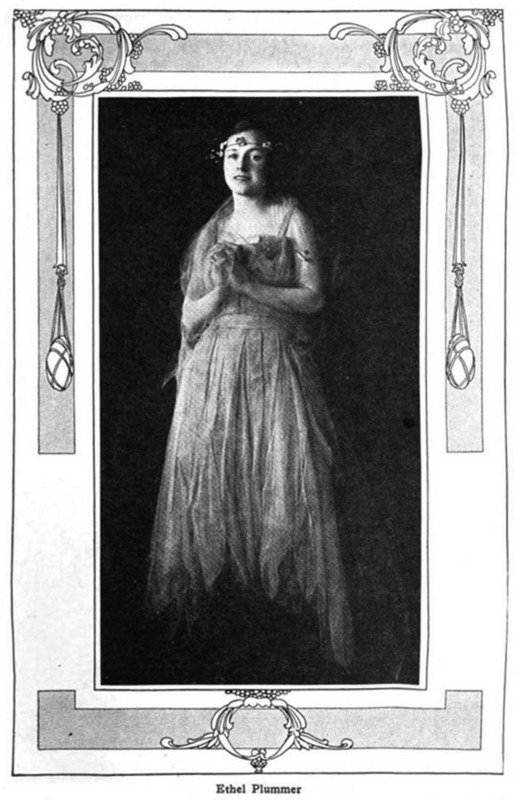 In 1914 she attended the annual costume ball of the Society of Illustrators and Artists League at the Biltmore Hotel. Another art student at the same event was Norman Jacobsen (1885-1944). He was born in 1885 in Cokesville, Wyoming and had recently come to NYC to study art. Ethel Plummer was an activist in the Women's Suffragist Party. 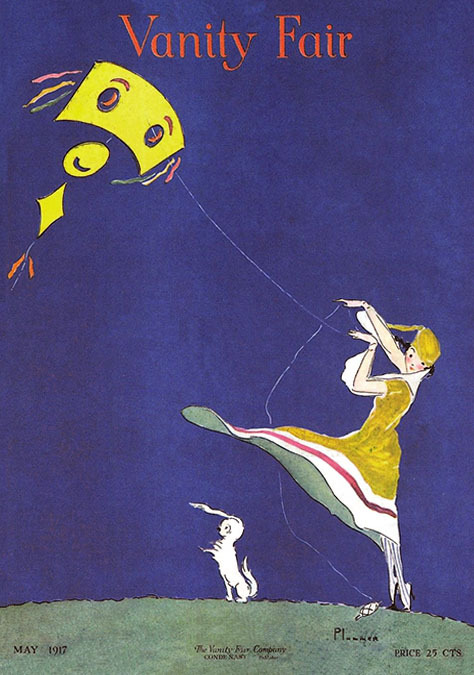 In 1915 she created an eight-foot-tall campaign poster that was exhibited on placards in theater lobbies and pasted to theatrical billboards. 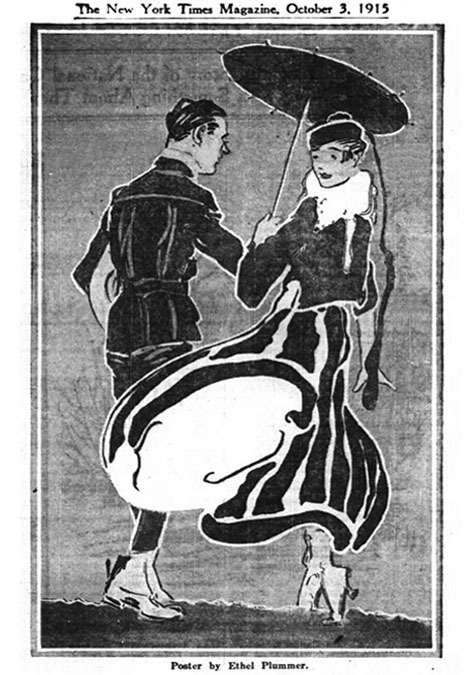 Her design featured a stylish couple sharing an umbrella with the caption, "You ask us to attend shows with you, and join you for dinner, and marry you, so why don't you ask us to vote with you?" In 1915 she participated in an historic demonstration to disrupt a male-oriented public sporting event. The Suffragists bought tickets to a boxing match, but instead of joining the spectators, they climbed into the boxing ring and gave an impassioned speech in defense of Women's Right to Vote. Their non-violent protest lasted until they were forcibly removed to paddy wagons by arresting patrolmen. In 1916 the Plummer family left Brooklyn and moved to Manhattan's Greenwich Village, where they lived at 112 West 11th Street. 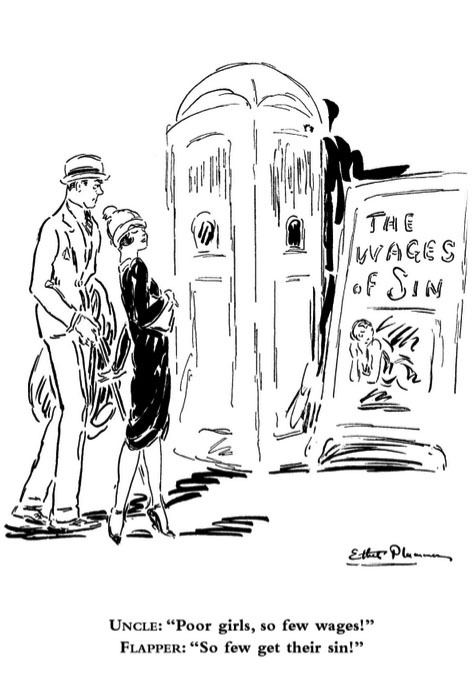 Ethel Plummer drew illustrations for The New York Times The New York Herald, Life, and Vanity Fair. 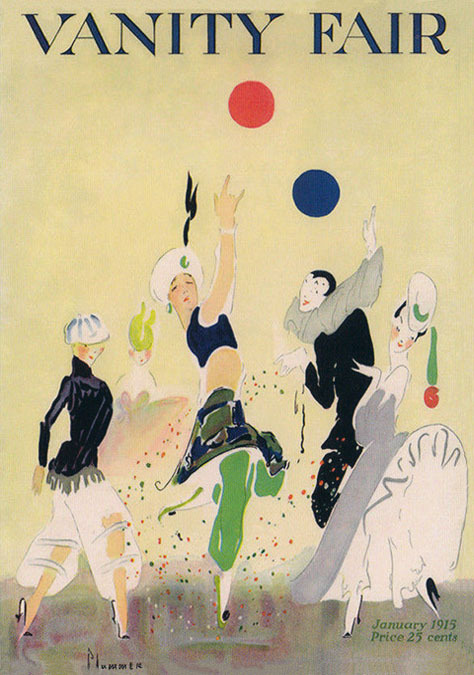 She became a celebrated illustrator and was personally featured in fashion periodicals, "as distinctive as her work. Her personality suggests breeziness, and 'The Ethel Plummer Girl,' now copied so much, is none other than Ethel Plummer herself - chic, vivacious, active, up-to-the-very-last-second in everything." 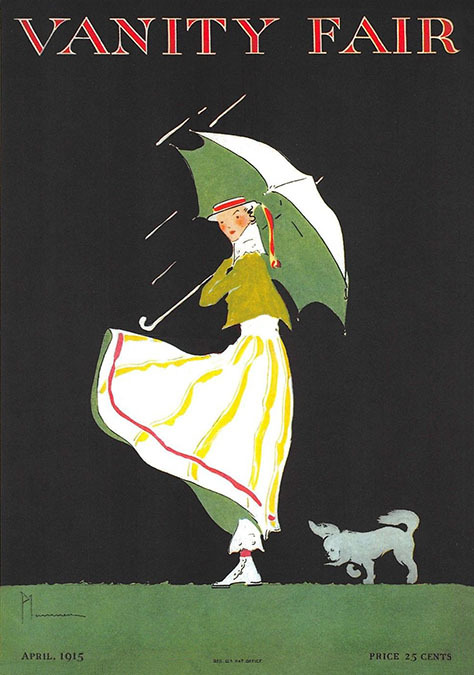 She was an active member of the Society of Illustrators of NY. 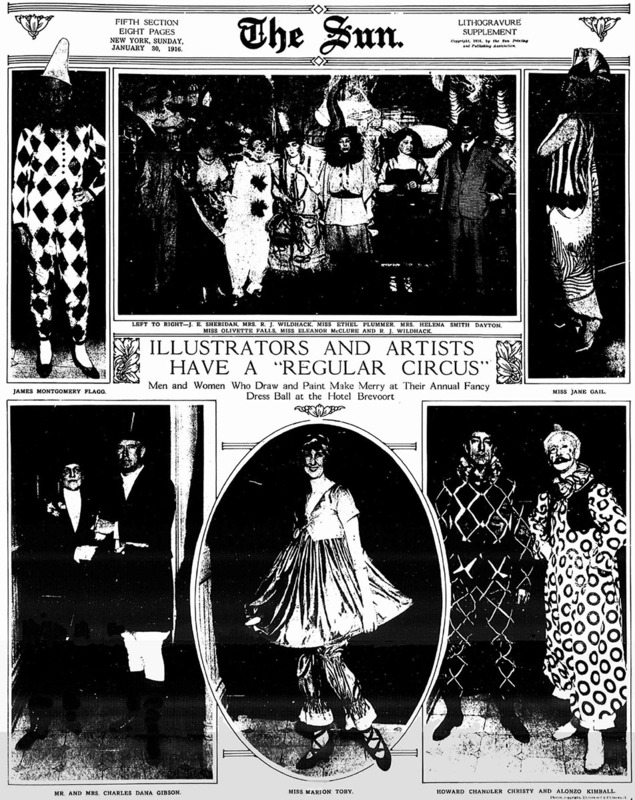 She participated in their festive annual costume balls, which were largely stag affairs until 1916, when the women of the club organized the event. She dressed as Pierrette, a female version of Pierrot, the amorous clown of Parisian Commedia Dell'Arte. She eventually served as Vice President of the club. 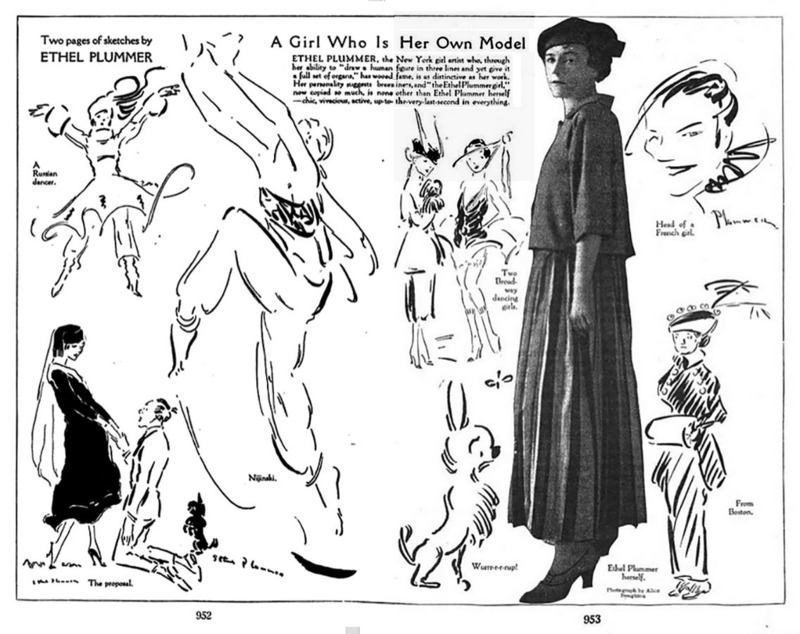 Other distinguished members included Charles Dana Gibson (1867-1944), Lejaren A. Hiller, James Montgomery Flagg (1877-1960), and Rube Goldberg (1883-1970). 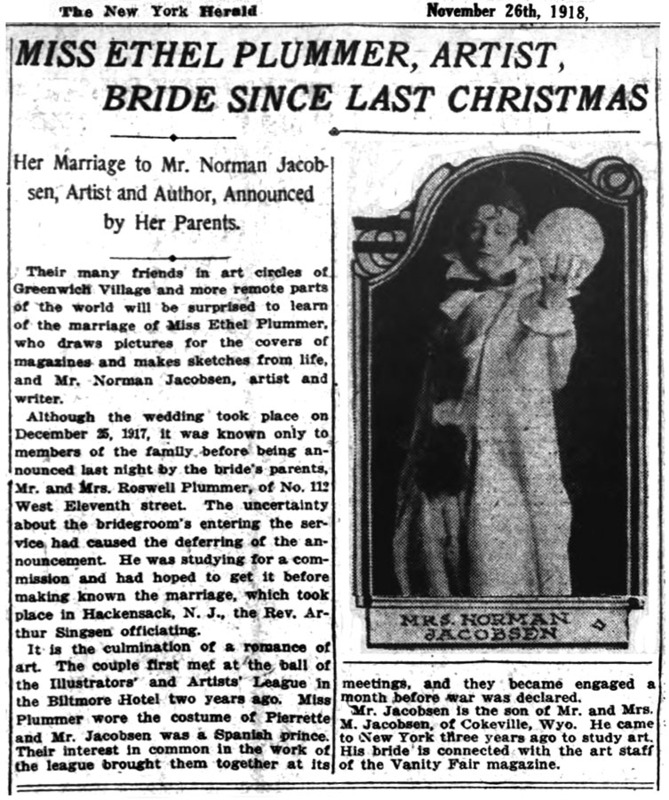 On Christmas Day, December 25, 1917, Ethel Plummer married Norman Jacobsen. The wedding took place in Hackensack, New Jersey. Following the wedding the groom was drafted and served overseas in the infantry during the Great War. On April 18, 1923 her father, Roswell Plummer, died at the age of seventy-two. 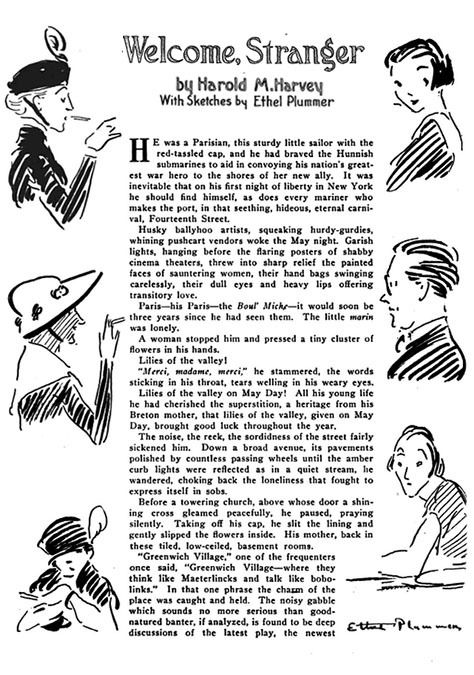 Ethel Plummer was the first woman artist published in The New Yorker Magazine. 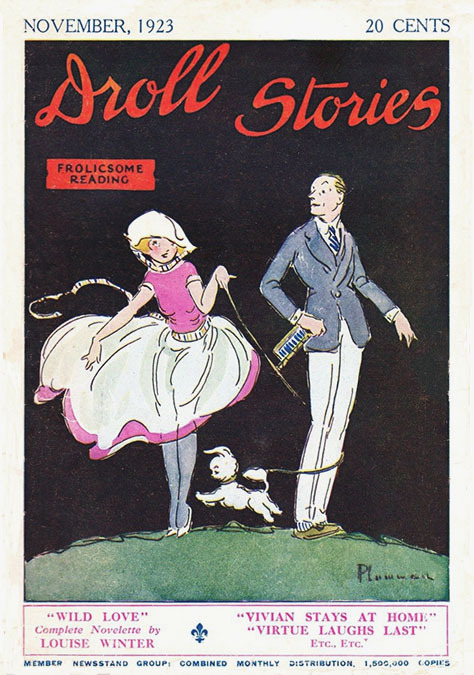 Her work appeared in the premiere issue in 1925. 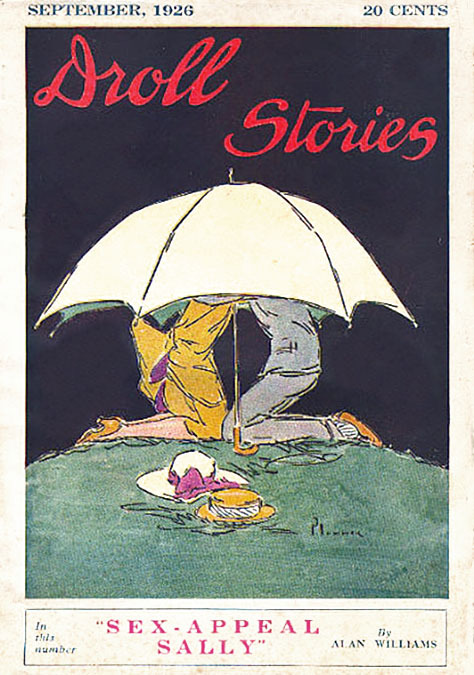 She also contributed illustrations to Vogue, Shadowlands, and Scribner's Magazine. 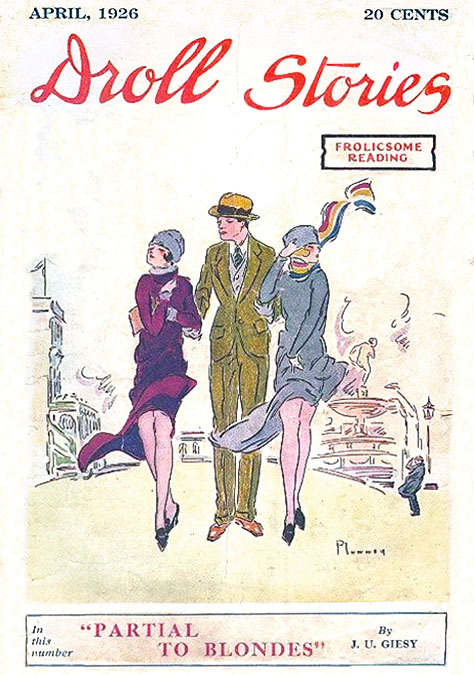 During the roaring twenties she created covers and story illustrations for pulp magazines, such as Droll Stories, Saucy Stories, 10-Story Book, and Young's Realistic Magazine. In 1926 Ethel Plummer lived with her widowed mother at 305 Broadway, on Duane Street, three blocks north of City Hall. They also owned a cottage in Westport, Connecticut, a community that attracted many celebrated artists, such as William Glackens (1870-1938), Harold von Schmidt (1893-1982), Steven Dohanos (1907-1994), and F. Scott Fitzgerald (1896-1940). 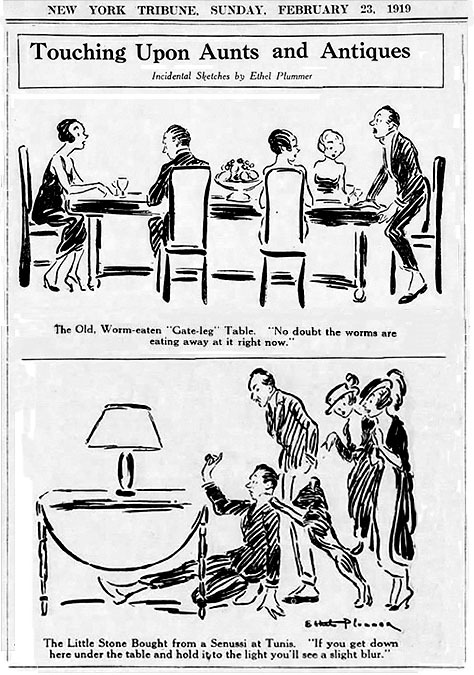 On August 16, 1929 nationwide newspapers reported a scandalous scene of domestic discord. 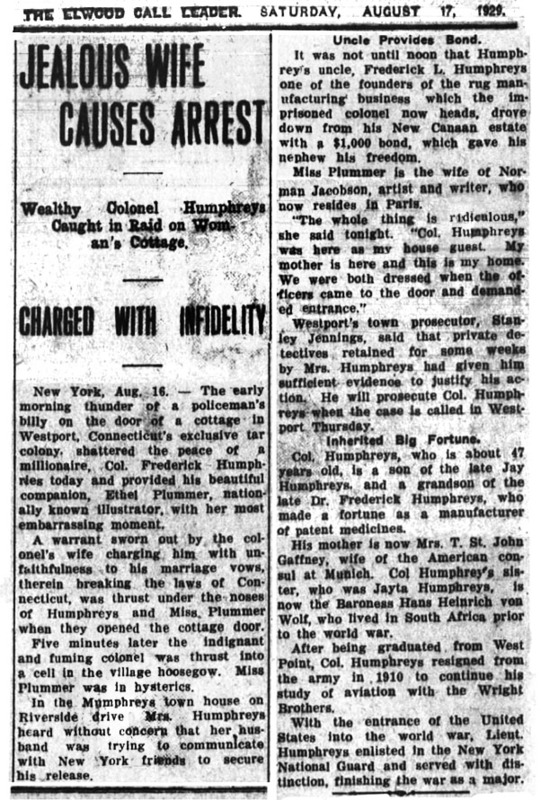 Following several weeks of surveillance by private investigators, the neglected wife of the millionaire Colonel Frederick Humphreys sent police in the early morning hours to Ethel Plummer's cottage in Westport Connecticut to serve her husband with an arrest warrant for unfaithfulness to his marriage vows. According to the artist,"The whole thing is ridiculous. Colonel Humphreys was here as my house guest. My mother is here and this is my home. We were both dressed when the officers came to the door and demanded entrance." Colonel Frederic Erastus Humphreys (1883-1941) was born September 16, 1883 in Summit, New Jersey, heir to a prosperous family of manufacturers of tapestries and patent medicines. He was a graduate of West Point and associate of the Wright Brothers. He had served with distinction in the Great War at the rank of Major, and afterwards became Commander of the 102nd Engineers Regiment of the New York National Guard. His mother was the wife of the American Consul at Munich. His sister was the Baroness Hans Heinrich von Wolf of South Africa. 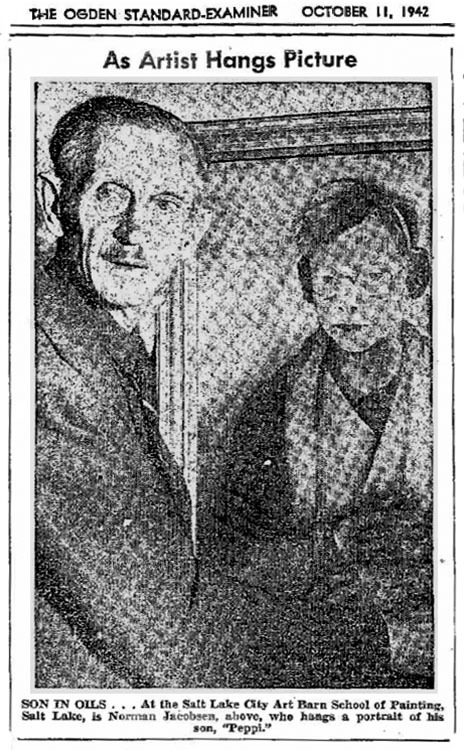 His estranged wife, Myrtle Lee Humphreys, was born in 1883 in Jonesboro, Arkansas. She instituted divorce proceedings and demanded a monthly alimony of $7,700 and ownership of their Manhattan townhouse at 41 Riverside Drive. 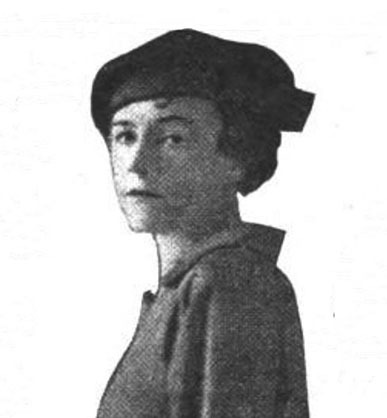 In the aftermath of this spiteful divorce, Ethel Plummer amicably divorced her estranged husband, Norman Jacobsen, who had been living in Paris, France, since 1924, after which he married Sutton Vane, a playwright, born in 1885 in England. Their son Joseph Jacobsen was born in 1928. Over the subsequent decade the Jacobsen family lived in Russia, Manchuria, Casablanca, and Majorca during the Spanish Civil War. In 1930 Ethel Plummer lived with her mother at 21 East 10th Street, which was a residency hotel in Greenwich Village. Ethel McClellan Plummer Jacobsen Humphreys died at home from a cerebral hemorrhage at the age of fifty-eight on October 31, 1936. Her obituary in The New York Times identified her as the wife of Colonel Frederick Humphreys. Five years later her mother, and life long companion, Eliza Plummer, died at the age of eighty-six on February 9, 1942.